Secure your home and illuminate a dark path with motion lights. They add convenience and security by detecting movement and turning on. Light your driveway to make your home safer and more attractive at night! Never walk to your home in the dark. 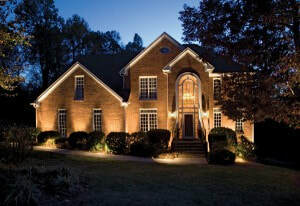 With pathway lighting you can make it easier and safer for you and your guests. Highlight your home with accent lights. This will create a visual interest to your home in an elegant and sophisticated way. Create a beautiful nighttime focal point for your water garden or any traditional landscape. When you keep your outdoor areas illuminated, you present a feeling of care and involvement. ​If you have a deck or patio with seating, add comfortable and attractive lighting to enable you to use these areas after dark. 1. 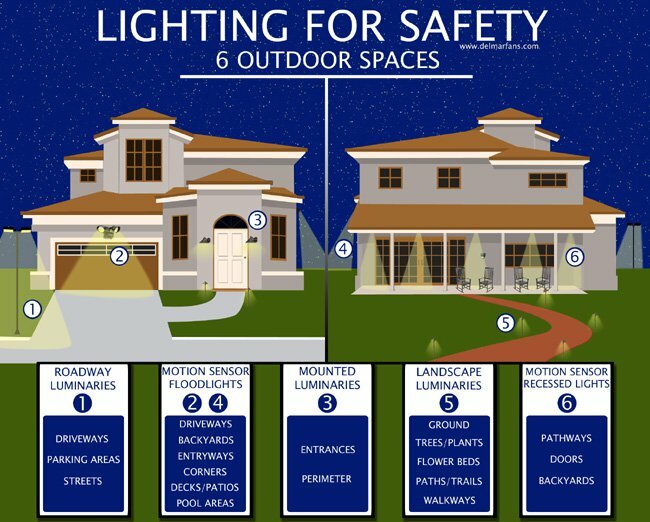 Safety - Outdoor lighting can add safety in a variety of ways. Light walkways to ensure that people navigate these areas safely. Use zone lighting to illuminate areas of your yard and landscape for nighttime use. Zone lighting can be effective for lighting a patio, deck, garden, pool area or outdoor seating area. Illuminate sidewalks, driveways, garages and entryways to keep your landscape safe after dark. The more lights, the safer your outdoor areas will be. 2. Security- A well-lit landscape and yard presents a feeling of security and maintenance. When you keep your outdoor areas illuminated, you present a feeling of care and involvement. When people view your well-lit yard, they often interpret your property as cared-for and well maintained. This can discourage trespassing and theft. Install lights with motion detectors so they illuminate when motion activates them. A dark yard can be splashed with bright lights when someone walks through your yard – this can be helpful for family and friends to keep people safe and it can also deter would-be criminals from trespassing on your property. 3. 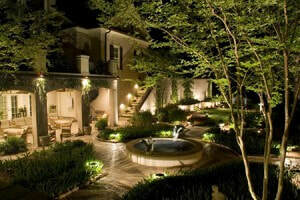 Comfort- Extend your living areas by lighting your outdoor landscape. If you have a deck or patio with seating, add comfortable and attractive lighting to enable you to use these areas after dark. The ambiance of outdoor seating can be pleasant and inviting, especially when you feature attractive outdoor lighting that adds to your outdoor decor. Use a combination of uplights as well as lights installed on outdoor structures to illuminate your seating areas effectively. ​4. Decor -Showcase and highlight specific areas of your landscape with decorative lighting. By installing uplights around your landscape in various spots, you pull the eye to these areas and display them attractively. Landscape lighting is an effective way to display planting areas or flower gardens. Install mood lighting along outdoor buildings to add pleasant splashes of light in your landscape. You can even add low-voltage exterior lights to trees and shrubs outdoors to illuminate planting areas and add beautiful accents to your exterior areas. 5.Curb Appeal- A well-lit home presents a cared-for impression to the entire neighborhood. Your house will appear warm and inviting as it sits quietly on your property. In contrast to a dark and drab home, your illuminated home will draw people in and offer a warm refuge for family and friends. Regardless of the purpose of your outdoor lighting, the benefits are all positive. From increasing safety and security to creating a warm and inviting environment, adding outdoor lighting will enhance and beautify your home.